Built: 2016. Type: Design and Construct. 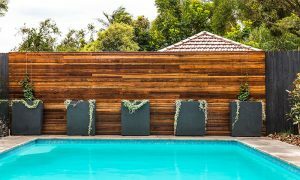 Project details: Spotted Gum feature screens, sandstone/Spotted Gum bench seats with overhead lighting, limestone pathways, exterior lighting, fully automated irrigation and seasonal planting. Built: 2014. Type: Design and Construct. 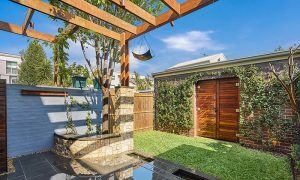 Project details: Garage construction, Bluestone tiles, Spotted Gum pergola and feature screening, stone piers, water feature incorporated into outdoor dining area, outdoor lighting and irrigation incorporated into the homes ‘smart system’.